Pave set with color enhanced stunning yellow, beautiful blue, and natural white diamonds. 160 sizzling stones set into a heart shaped 10 karat yellow gold foundation with a classic screw back backing completes the unique and precious look of these earrings. 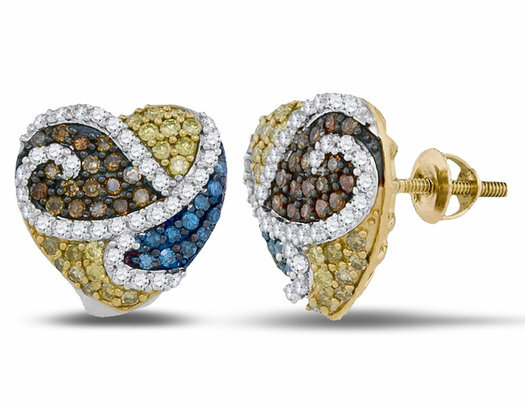 This special heart shaped stud earrings include 1/3 carat of yellow diamonds with, 1/6 carat of icy blue diamonds, and 3/4 carat of white diamonds.